There's nothing that instills a sense of respect quite like an "M.D." after one's name, and that's certainly also true of the classic white lab coat. People admire and revere doctors, and why shouldn't they? It's a noble profession. That's why when you go out wearing this dignified Dr. Seymour Bush Costume, everyone you meet, everywhere you go, will respect you. Deeply. They'll look upon your fine name and the specialty you've chosen with instant gratitude and admiration, for only the finest of medical professionals can protect the health of the world's women. Now, you might think you hear people "laughing" when you frequent upscale establishments such as wine bars and bistros, but it's probably just because they're jealous of your success and respectable bearing. Heck, who are we kidding? Laughs are exactly what you're going for with this awesome, simple, and hilarious costume. 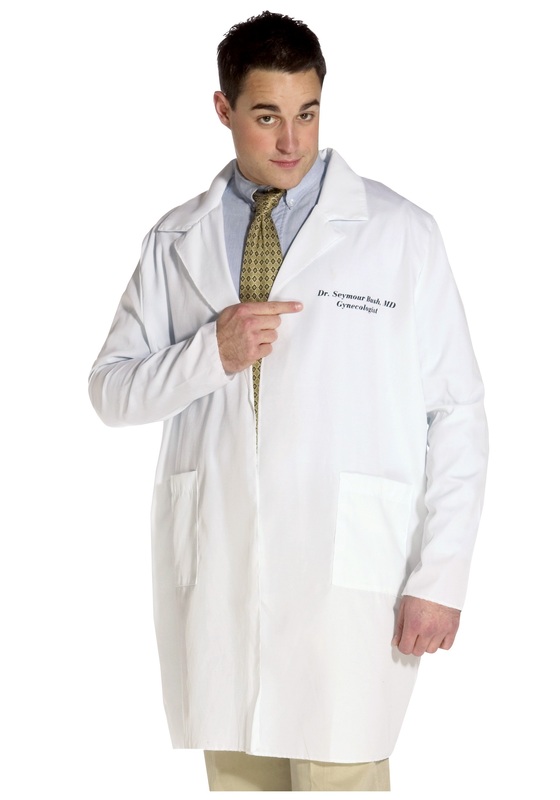 Those who get the joke will instantly think you're the boldest, funniest guy at the Halloween party, and those who don't... well, they'll probably just think you're an off-duty doctor who chose a demanding specialty and simply needs a break. You can wear this smock with practically anything (including a tie, dress shirt, and slacks, like the fine gentleman in the picture) and your fellow partiers will think you're a medical professional. But we suggest going the extra mile with a set of medical scrubs and doctor's accessories like a stethoscope -- all of which we happen to sell right here. So if you're looking to scare up some serious laughs this Halloween, this Dr. Seymour Bush Costume is just what the gynecologist ordered!